اجازه بدهید برخی از ایده های اصلی در مورد بهبود شطرنج را مرور کنیم. اول، باید آموزش های شما به طور عمده بر اساس بهبود سیستم تفکر و نه بر پایه انباشت "بی معنی" دانش باشد . این موضوع متشکل از مراحل فکر کردن در طول بازی است، اول من در مورد این حرکت فکر می کنم، دوم راجع به حرکت دیگر و به همین ترتیب. در درس "چگونه بازی کنیم" من به شما برخی از اطلاعات اساسی در مورد روش صحیح تفکردادم . اینک زمان تمرین آن است . روش تفکر درست که باید در طول بازی استفاده می شود، که اجازه می دهد شما را به پیدا کردن بهترین حرکت در هر موقعیت. گزارشی از تجربیات و توصیه های عملی از بسیاری از بازیکنان موفق (استاد بزرگ). شما می دانید که چگونه برای یادگیری شطرنج به طور موثر. شما قادر به محاسبه تغییرات سریع و دقیق خواهد بود. شما می دانید که چگونه برای ایجاد یک مجموعه باز به درستی. شما سال ها تلاش صرفه جویی کرده و پیشرفت سریع می باشد. شما به طور کامل درک عوامل روانی لازم برای موفقیت در شطرنج. شما اشتباهات معمول در توسعه شطرنج، جلوگیری از اشتباهات در مقابل بازیکنان شطرنج . شما یک مزیت بزرگ بیش از مخالفان خود را دریافت کنید. شما اسرار بسیاری از استادان بزرگ "می دانند. این درس کشف بزرگترین اشتباهات و بزرگترین مشکلاتی است که بسیاری از بازیکنان شطرنج را. این بسیار مهم است که آنها را درک اولیه به طوری که شما ادامه خواهد داد و آنها را در توسعه شطرنج خود را. در این درس، من خواهد شد شما می گوید که دقیقا چه استاد بزرگ در یک بازی شطرنج فکر می کنم. شما یک سیستم واضح و روشن از فکر کردن شامل چند مرحله آسان است. پس از این آموزش به ارمغان خواهد آورد شما استاد بزرگ نتایج: از شماره! "چگونه به آماده شدن برای بازی". درس 4: "چگونه شطرنج را یاد بگیرم". "این حدود 15 سال زمان برای من برای تحقق بخشیدن به این چیزها.حالا شما می توانید اسرار موفقیت شطرنج را در چند ثانیه دریافت کنید! " Garry Kasparov is presenting the 1st prize to Igor Smirnov “Kasparov’s Cup-2009″. I have created my special system of chess education, based on the psychological principles of effective learning and extensive chess practice. The course contains not only my experience but also experiences from a lot of my friends: Grandmasters, trainers and other chess players, who helped me perfect the course! Many thanks to you guys! Now the course contains a lot of recommendations, which were taken only from SUCCESSFUL PRACTICE. Every chess player wants to improve himself and make progress, however, one of the biggest problems is to understand how to do it. The usual ways of training give very slow progress and even sometimes these are completely ineffective. Did your RESULTS become better after reading a chess book? The usual (and very sad) answer is “No”. Finding a GOOD chess coach is also a huge problem. How many chess teachers do you know who can say: “I know exactly how to get progress in chess and I can guarantee it to you.”? The most popular answer is “Zero”. “Pointless knowledge”, which doesn’t give you any concrete results, is the biggest problem for all the chess players! During my chess career as a player and as a coach I have thought about an effective way of learning all the time (you can read more about it here: About me). That’s why I decided to develop a chess course “The Grandmaster’s secrets”. With pride I can say that this course will give you only the concrete skills (no more pointless knowledge!). I have created my special system of chess education, based on the psychological principles of effective learning and extensive chess practice. The course contains not only my experience but also experiences from a lot of my friends: Grandmasters, trainers and other chess players, who helped me perfect the course! Many thanks to you guys! Now the course contains a lot of recommendations, which were taken only from SUCCESSFUL PRACTICE. The effectiveness of my teaching system was proven by my own practice and the results of a lot of my pupils. WHAT WILL YOU GET FROM THE CHESS COURSE “THE GRANDMASTER’S SECRETS”? The correct thinking method that should be used during games, which will allow you to find the best moves in any position. A concrete guide on what and how exactly you should study to become a strong player. You will know how to use all the knowledge which you already have to finally get concrete results. An account of experiences and practical recommendations from a lot of successful players (Grandmasters). You will know how to learn chess effectively. You will stop making blunders. You will be able to calculate variations quickly and precisely. You will know how to create an opening repertoire properly. You will save years of effort and get fast progress. You will fully understand the psychological factors necessary for success in chess. You will avoid the typical mistakes in chess development, which nearly all chess players make. You will get a great advantage over your opponents. You will know many Grandmasters’ secrets. This lesson discovers the biggest mistakes and biggest problems which most chess players make. It is very important to realize them early so that you won’t continue making them during your chess development. It will help you save years of training and help you reach your goals quickly rather that waste your time on futile efforts. It is much more important to improve one’s thinking process rather than get new pointless knowledge all the time. Improving of your thinking system allows you to find the best move in any position. In these lessons, I will be telling you exactly how Grandmasters think during a game of chess. You will get a clear system of thinking containing several easy steps. Following this tutorial will bring you Grandmaster results! In this lesson we will discuss tournament preparation, specifically, when there are several weeks of pre-tournament preparation time. Pre-tournament training should be focused on bringing you to your peak of chess condition so that you are able to do your very best in the competition. During the lesson you will learn how the Grandmasters make it. In this lesson, we will discuss preparation for the next round in a tournament when the next opponent is known. During this lesson, I will tell you the grandmaster’s secrets of preparation. Using these ideas, you will be able to neutralize your opponent’s preparation and win many games by having a theoretical and psychological advantage before the game even begins! All chess players learn chess, but some players play much better than others. What does this mean? It means that many players learning is ineffective. In this lesson I will tell you the secrets of the Grandmaster’s training. After studying the video lessons in the course “The Grandmaster’s secrets” you will receive certain knowledge with which you will be able to achieve real progress. But it is necessary to put the received knowledge into practice. This practical addition to the course will help you with this! The practical part of the course contains 200 special games and tasks, which will help you put course’s ideas into practice. You will also get the program for self-trainings. This detailed guide explains what and how you should do to increase your chess power. What will the practical part give you? You will get the detailed program for your independent training, which contains concrete tasks and instructions. You will understand the ideas of the course better. You will remember the ideas of the course better. You will start to calculate variations quickly and precisely. You will train the right way of thinking, which will allow you to find the best moves in any position. And the main thing: you will train this knowledge in practice – so you will really get these practical skills. The program is designed for several months of training (2-4 depending on how much time you spend on chess per day). After the completion of all the tasks in the practical part of the course you will really get the practical skills necessary to become a Grandmaster! Time is money… Having spent a little money now, you will start to get prizes much faster! Now the time of boring books goes by. Most likely you have noticed that 80% from them are a collection of a considerable quantity of theoretical information, which does not provide real progress. Besides, it’s been proven a long time ago that text information is digested much worse than the same information in video-format since people remember only 10% of what they have read, 20% of what they have heard and 70% of what they participated in. Thus, the video-format involves all channels of perception and provides peak efficiency of training. Chess is becoming more and more popular. Accordingly, the quantity of strong players has recently increased considerably. The weak opponent can be beaten, using well-known chess knowledge. For a victory over a strong opponent it is necessary to possess unique and effective skills in addition. The chess course “The Grandmaster’s secrets” contains a unique system of an effective game and training, which will give you a great advantage over the opponents (proven by practice!). 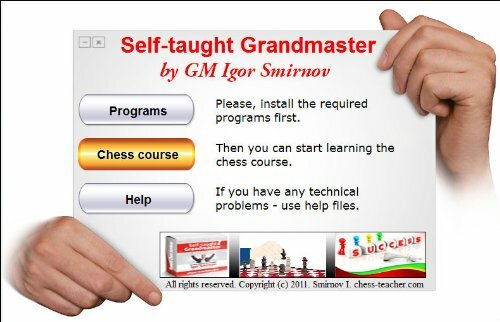 “THE GRANDMASTER’S SECRETS” A REMOTE CHESS ACADEMY! 4- اول برنامه ،pgn_viewer.exe را نصب کنید دوم برنامه ،video_player.exe یا همان گام پلیر را نصب کنید.